Jerry Forney’s name echoes a lingering respect from all of his solo work and his music with The Forney Brothers and frequenting blues taverns for several years now. 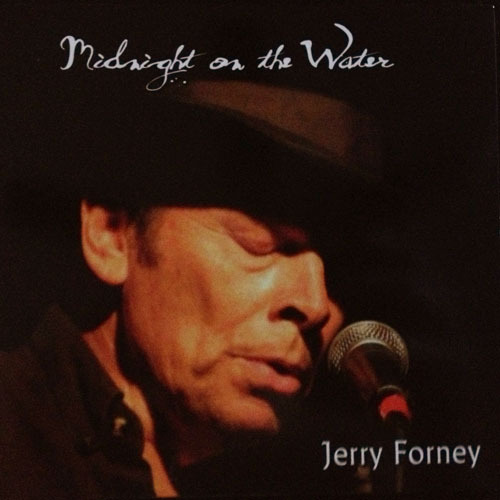 It appears Jerry Forney just gets more comfortable with himself and his music with his new record, Midnight on the Water. There is no mistaking that this is a blues record but there are several moments where you can feel a down-home country influence as well. It is hard to shake up the way blues songs sound and Forney doesn’t really do that here but what he does accomplish is he makes a solid album that only a bluesman with decades of experience could make and it doesn’t feel forced one bit. The clear highlight here is the starch of “Chrome Where I Need.” This song works well for Forney’s music as well as the clever wordplay in the song. He takes a very played-out genre of blues and puts just enough chrome where he needs it to make Midnight on the Water a fun listen. The hometown saga of “Ghost (the testimony of Jesse James)” takes interesting turns when it keeps from ever mentioning Jesse’s name. The soft touch of “Rainbow” has a delicate sweetness that almost makes up for all the heartbreak all over most blues songs. Good blues records act as time capsules and this one is no exception. This album was made in 2013 but easily could be from 1983; in 20 years this record will likely sound like it could have been recorded then too. There are few things more consistent and reliable than the blues, and artists like Jerry Forney who do it well. This entry was posted in Local Album Reviews and tagged 2013, 250 word local album review, album review, cd, Chrome Where I Need It, Forney Brothers blues band, Jerry Forney, Jesse James, Midnight On The Water, record. Bookmark the permalink.